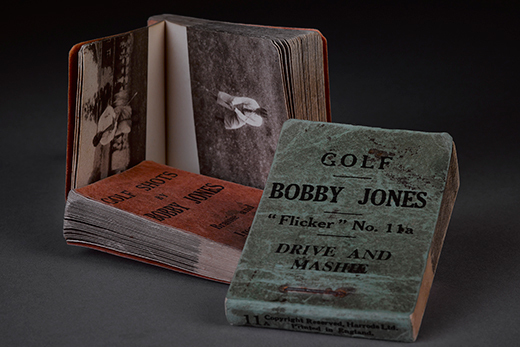 The Bobby Jones exhibit at The Open at St Andrews will include these matchbook-size flicker books, also called flip books. Each page contains an image that shows Jones in a different stage of his swing; when the pages are flipped quickly, his famous golf swing appears to be in motion. The Emory Libraries’ exhibition “Bobby Jones: The Game of Life” will travel to St Andrews in Scotland next month for The Open Championship. This exhibit, a condensed, traveling version of the one currently in Emory University’s Robert W. Woodruff Library, will be on display in the Spectator Village at The Open (known as the British Open on this side of the pond) July 12-19 at the Old Course at St Andrews. The Open draws approximately 200,000 fans each year. an iPad kiosk with video of the 1958 St Andrews Freedom of the City ceremony, an event that granted Jones certain rights of citizenship within the town. Emory’s Robert T. Jones Jr. Scholarship recipients studying in Scotland have volunteered to join library and university personnel to help staff the exhibit tent, Gue says. The scholars are Emory students who exchanged schools with their counterparts from the University of St Andrews for a year of study, leadership and cultural exchange. The exhibit will include a panel highlighting the Robert T. Jones Jr. Program in the Laney Graduate School, which includes the Robert T. Jones Jr. Scholarship; the Robert T. Jones Jr. Fellowship; the Jones Biomedical Engineering Fellowship; and the Jones Program in Ethics. The main exhibition, featuring materials from two Bobby Jones-related collections in MARBL, remains on display in the Woodruff Library at Emory University until Nov. 30, 2015. For more information, visit the library’s exhibitions page. To arrange a group tour, send an email to library.exhibitions@emory.edu.